Renew your home and garden with the home improvement benefits, improve your skills with DIY projects and always check out the Big Lots Ad to beware of all the deals of the week. You can usually find price drops on some nice and popular products of the Big Lots Weekly Ad. While discovering the trends of home and outdoor furniture, you will also realize how much you can save on the new items. Alternative ways of lowering the costs of what you buy for your projects or ideas can also be the point of browsing these ads because they also got the coupon discounts. Offers Big Lots product can be many things of departments such as toys, grocery, electronics, and other things apart from the home improvement. The brand has 1400 stores in 47 states. The story of Big Lots began in 1967 which makes it 51 years of experience in retailing such products. In the same week, you can browse multiple weekly ads which are particularly important for a certain group of products. It can be Lawn and garden, living room furniture, and a specific deal, for example, Buy $100 Save $50. The store also offers rewards for your purchases. Subscribe to get emails about this and other weekly ads. 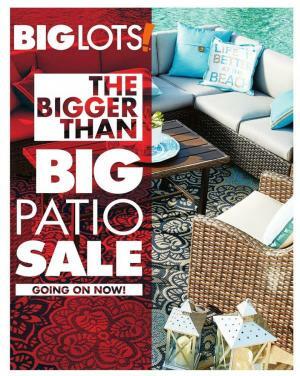 Big Lots Ad March is about outdoor patio sale. Limited numbers of outdoor seating sets, wicker seating, dining sets, decorative accessories, gazebo, mattress sets, and more are available. Install a comfortable corner in your backyard. 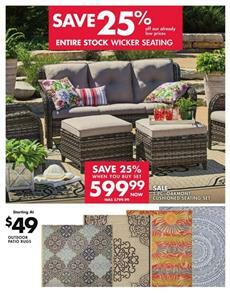 Save 25% off entire stock wicker seating. Buy 4 pc. Westwood cushioned seating set for only $337.49! Cushioned seating sets look comfortable and enjoyable on a shiny day. Check out 5 pc. Oakmont cushioned seating set that has a $599.99 price currently. Go for a comfortable floor where you sit and relax in your garden. Outdoor patio rugs start at $49 at Big Lots. Summer is coming and you have great deals at Big Lots. 7 pc. grandview cushioned high dining set is one of the best ones. Pay only $1099.99 and save $100 when you buy the set. Cover yourself from the sun and relax under the shade of Lakewood hardtop gazebo. The price is only $1099.99 which is $100 cheaper.